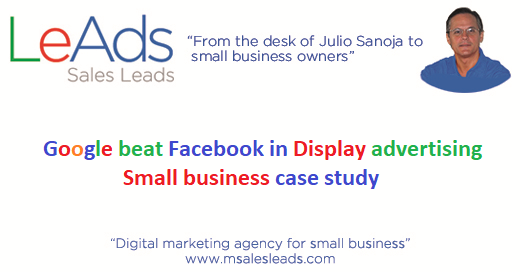 This article is addressed to small business owners and marketing managers that are searching for digital marketing and digital advertising case studies for small businesses. 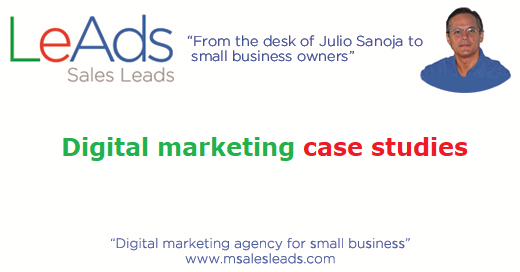 We will present the following four case studies from some of our customers and from our digital agency. Results: 370 website visits with Google campaign and 105 website visits with Facebook/Instagram campaign in 1 month, for a total of 475 website visits in 1 month. Campaign used: Google SEO campaign with article marketing. This article was written on October 1, 2018. This article, and all our previous articles, are originally published at our Blog at http://www.msalesleads.com/category/articles/http://www.msalesleads.com/category/articles/ , and then they are distributed in all our social network pages, and email marketing. How our digital marketing agency gets an average of 4 qualified leads per month? This article is addressed to small business owners and marketing managers that want to know how they can get qualified leads every month through article marketing. Our digital agency is a 3 years old agency. Since march 2018, our digital agency has been getting an average of 4 qualified leads per month; after 3 years of executing a permanent article marketing campaign. 300 articles produced, published, and distributed during 3 years. It took us 3 years and 300 articles to begin to position the agency at the first page of Google search results. We are just beginning. Article marketing is the master piece of our strategy. It has been only 3 years since we started the business in Miami. We had a digital agency in Caracas, Venezuela from 2002 until 2015 when we decided to close the agency due to the economic, political, and social situation in Venezuela. Our Venezuelan agency was named Empresa Web, and we executed 130 digital projects and campaigns during these 13 years of operations. Most of these customers were obtained through article marketing campaigns for search engine optimization, develop trust, develop authority, and positioning the agency at the first page of Google search results, social networks, and email marketing. Our prospects and customers found our agency in Google, when they searched for digital agencies in Venezuela. Our second lead generation tool was Social Networks, mainly LinkedIn, and email marketing. At the beginning we also did Google Ads. 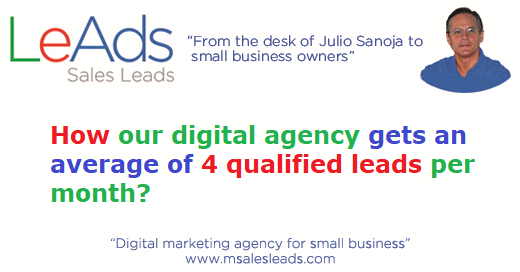 We opened the new digital agency in Miami in 2015, and we named it MSalesLeads. We knew from our previous experience in Empresa Web, that we needed to design and execute an article marketing campaign to position the new agency at the first page of Google search results, social networks, LinkedIn, and email marketing; in Miami, and other USA cities. We have been doing article marketing for 3 years so far, and we have produced, published, and distributed near 300 articles during these last 3 years, since 2015 until the present 2018. After 3 years of an article marketing campaign, and near 300 articles produced, our agency is getting an average of 3,000 Google search impressions per day within the first 6 pages of Google search results, and an average of 150 Google search impressions per day at the first page of Google search results. This is our qualified lead generation tool. From march 2018 to the present date, august 2018, we have been obtaining an average of 4 qualified leads per month from the first page of Google organic search results, thanks to the article marketing campaign. Pure Inbound marketing. We also get qualified leads in a minor quantity from LinkedIn and email marketing. The article marketing campaign is the center and master piece of all our strategy. The article marketing campaign has given our agency trust and authority in front of our prospects and customers, and also, in front of Google search algorithm. We developed trust and authority through the article marketing campaign. It took us 3 years to achieve this important digital marketing goal, but we are happy and proud, and we are beginning to obtain the results. We are just beginning. As per our previous experience in Empresa Web, the number of qualified leads per month will increase with time. So far, during these 3 years, we have executed 10 digital marketing projects and campaigns, all these customers have been obtained online, at the first page of Google search results, LinkedIn, and email marketing. We are just beginning to get qualified leads from the first page of Google search results. It took us 3 years and 300 articles, to position the agency at the first page of Google search results in Miami and in the rest of the country. We will keep the article marketing campaign in a permanent manner, as we recommend to our customers. A featured snippet in search is a featured search result that Google places at the top of the first search results page, in a special featured manner. Google considers that this result is the best answer to the search query. A featured snippet in search shows that Google trust this content, and Google believes that this content is a good answer to the user search query. Small businesses may achieve featured snippets in search by executing an article marketing campaign. 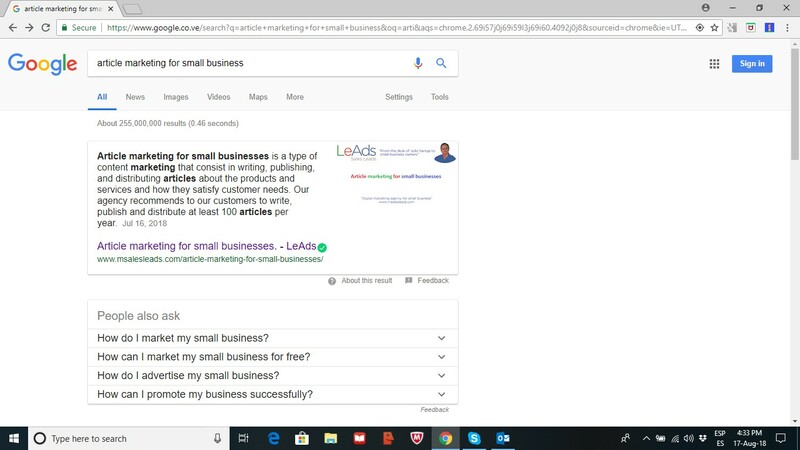 Small businesses may achieve featured snippets in search by producing, publishing, and distributing articles about their products, services, and how they satisfy customer needs. Our agency has obtained a Google featured snippet in search for the search term: “article marketing for small businesses”, and we are happy and proud about it. Once again, this result shows that article marketing gives many advantages to small businesses. How can small businesses get earned media? Small businesses can get earned media by writing, publishing, and distributing articles about their products and services, and how they satisfy their customer needs. This is article marketing. Small businesses can get earned media by doing article marketing. Small businesses can have three type of digital media: owned media, paid media, and earned media. Owned media is the digital media that can be administered and managed by the small business. Examples of owned media are the small business website, blog, social networks pages, social network group pages, social network communities’ pages, social networks blogs, email marketing platform, directories listings. Paid media is the digital media that can be obtained by small businesses by paying advertisers or media owners. Examples of paid media are Google Ads campaigns, Facebook Ads campaigns, Instagram Ads campaigns, LinkedIn Ads campaigns, Amazon Ads campaigns; major media sponsored content campaigns, press releases, PR campaigns. Earned media is the digital media that small businesses can get for free. Earned media is a free promotional media that small businesses get thanks to their own promotional efforts, mainly by article marketing and customer satisfaction. Examples of earned media are likes, comments, and shares at social networks; virality at social networks; reviews at Google My Business, reviews at other online business directories; interviews at major media; interviews at niche media; listings at niche media; recognitions at niche media; featuring at niche media; links to owned media articles; featuring at niche marketplaces; listings at niche marketplaces. MSalesLeads was featured at UpCity as one of the top digital marketing agencies in Miami. 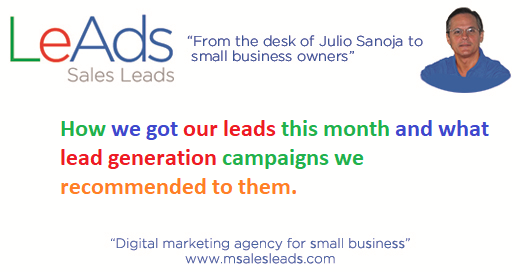 MSalesLeads was featured at Expertise as one of the top 17 digital marketing agencies in Miami. MSalesLeads was interviewed at Voyage MIA magazine as one inspiring story. MSalesLeads was featured at CV Magazine as a most outstanding agency for lead generation at Florida. MSalesLeads was featured at Medium Daily Digest as a top featured story in today´s highlights on July 17, 2018. Article marketing and customer satisfaction are two important business activities in today’s digital economy; and both activities can get you earned media as an additional benefit for your business and for your customers. Our agency got 5 qualified leads this month of june. Three of them from the first page of Google organic search results, and the other two from our organic content marketing campaign at LinkedIn. 3 from Google first page, and 2 from LinkedIn. There are two types of campaigns for lead generation for small businesses. Advertising campaigns and Content campaigns. Our agency does not use advertising campaigns anymore, even though we used them the first two years of operation. Our agency has been using content campaigns since our foundation in 2015. We have written, published, and distributed so far 250 articles about our services and how they satisfy customer needs. It has been, and it still is, a permanent content campaign, which has given our agency up today, 150 daily impressions at the first page of Google organic search results nationwide. This is our main qualified lead generation tool nowadays. After 2.5 years of a content marketing campaign, our agency gets most of its monthly leads through the first page of Google organic search results, and the other ones through the content campaign at LinkedIn. A content campaign takes 2 to 3 years to give results, and that is why we recommend advertising campaigns the first two years along with the content campaigns. After 2 or 3 years of the content campaign, you can pause the advertising campaigns. This is always our recommendation to our prospects and customers. The first 3 years you should do both advertising and content campaigns. After the third year you can pause advertising campaigns and keep only the content campaigns. It takes 2 to 3 years to position your brands, products, and services organically with the content campaign at the first page of Google, at social networks, and at email marketing. At the end of this article there is a link to our previous article about lead generation campaigns for B2B and B2C small businesses, both, advertising and content campaigns. This solar panel small business in Miami needs to get qualified leads in Florida. The audience are home neighborhood owners in Florida that want to install solar panel at home to get savings, fiscal, and environmental benefits from solar panel energy. We recommended two lead generation campaigns to this prospect. The first campaign we recommended was a Google AdWords Display campaign to get leads in the short term, in a matter of days after launching the campaign. The second campaign we recommended was a content marketing campaign for the long term, 2 to 3 years, to position the business in the state of Florida at the first page of Google organic search results, at the social networks, and at the email marketing; through the production, publication, and distribution of articles about the solar panels and how they can satisfy user’s needs. Google does not know who wants solar panel at Florida home neighborhoods, but Google knows who lives at the home neighborhood at Florida. Therefore, Google will deliver the ad to the home habitants that live at the home neighborhoods at Florida. Google will deliver the ad to these home habitants at their mobile, tablet, laptop, PC, and TV. We obtained this lead at the first page of Google organic search results. The solar panel small business searched for digital agencies in Miami and our agency appeared at the first page of the Google search results. This sugar, gluten, and smoking cessation small business at Miami needs to get qualified leads for their business. The audience are Miami habitants that want to stop consuming sugar, gluten, and tobacco. We recommended a Google AdWords Display campaign for the short term results, and a content marketing campaign for the long term results. Google does not know who wants to stop consuming sugar, gluten, and tobacco in Miami; but, Google knows who has visited this small business competitor’s website in Miami; therefore, Google will display the ad to the Miami habitants that have recently visited other websites that offer sugar, gluten, and tobacco cessation services. We obtained this qualified leads at the first page of Google search results. This small business searched for digital agencies in Miami and our agency appeared at the first page of Google organic search results. This small business consulting firm in Houston needs to get qualified leads to sell a psychological test software and a business training software to small and mid sizes businesses in USA. The audience are human resources managers at mid sizes companies in USA, and human resources firms’ managers at USA. We recommended to this small business consulting firm for the short term results to launch a LinkedIn Sponsored Content Ad campaign to deliver the content ad to the human resources managers at mid-size companies in USA, and to human resources firms managers at USA. LinkedIn big database advertising platform knows these audiences very well, therefore LinkedIn can deliver the content ad to these audiences when they browse through LinkedIn either at their mobile, tablet or laptop. Please keep in mind that LinkedIn big advertising database is segmented by several variables, including company type, company size, company name, job function, and job seniority. We recommended a content marketing campaign for the long term results, through the production, publication, and distribution of articles about the software’s and how they satisfy customer needs. We obtained this qualified lead at LinkedIn, through our content marketing campaign at LinkedIn. This is a small call center in Pakistan with 100 seats that needs to get qualified leads in USA to offer their call center services. The audience are auto insurance companies in USA. We recommended to this small call center at Pakistan, for the short term results, to launch a LinkedIn Sponsored Content Ad campaign to target auto insurance companies in USA and their executives. LinkedIn knows the auto insurance companies in USA and their executives. LinkedIn can deliver the content ad to these executives when they browse LinkedIn at their mobile, tablet, or laptop. We recommended to this call center a content marketing campaign for the long term results, through the production, publication, and distribution of articles about the call center services and how they satisfy the customer needs. 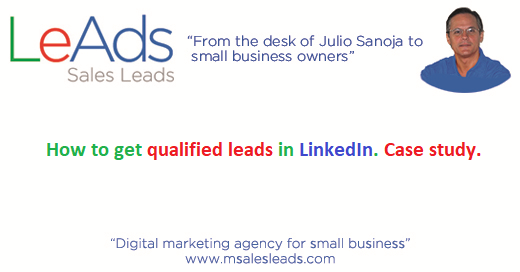 We obtained this qualified lead this month at LinkedIn, through our content marketing campaign. This capital loans for small business firm in Washington DC needs to get qualified leads for its business. The audience are small business owners in USA that need capital for their businesses. We recommended to this Company to launch two advertising campaigns for the short term results. One LinkedIn Sponsored Content Ad campaign to target small business owners in USA, and one Google AdWords Display campaign to target visitors to competitor’s website in USA. We recommended a content marketing campaign for the long term results, through the production, publication and distribution of articles about the capital loans and how they satisfy customer needs. We obtained this lead at the first page of Google search results. This company searched for digital agencies for small businesses and our agency appeared at the first page of Google search results. On November 2017 our agency was contacted by Joanne Stone, owner of Joanne Stone Design, to launch a one week display campaign to generate qualified traffic to their website for a product promotion. We designed and launched two display campaigns, one in Google AdWords Display and the other one in Facebook/Instagram Display. Campaigns audience were women between 30 and 65 years, living in high income neighborhoods in Miami, New York, and Los Angeles. Both campaigns were run during one week, from November 25th until December the 1st, 2017. The Google AdWords Display campaign generated 370 visits to the website at a total cost of $ 90.71 or $ 0.24 per visit. The Facebook/Instagram Display campaign generated 105 visits to the website at a total cost of $ 70.09, or $ 0.66 per visit. The Google campaign generated 3.52 times more visits that the Facebook /Instagram campaign at a cost per visit 63% lower than the Facebook campaign. Google Display campaign beat Facebook/Instagram Display campaign in both, the number of visits, and the cost per visit. This was an expected result. Google Display is more effective and more efficient than Facebook/Instagram Display. The main reason for this result is that Google Display delivers the ad to the audience in Internet (the whole), which is an open network, which does not require any login; while Facebook/Instagram Display delivers the ad to the audience in two closed networks (the parts), which require login. Google AdWords Display is the most effective, efficient, and satisfactory mass communication tool currently available in the market; where brands can deliver a text, image or video message to their target audience in any type of screen: mobile, tablets, laptops, TV, PC. How to get qualified leads in LinkedIn. David Stone, Ok2go Latam Director, on January 2018, asked our agency to get qualified leads for Ok2go Chile distributor. Ok2go Chile distributes the Ok2go Israel products and services in Chile. Ok2go Israel develops and sells software and apps for human resources presence and assistance control. Our agency designed and launched a LinkedIn Sponsored Content Ads campaign for Ok2go Chile to get qualified leads in LinkedIn. Industry type: Manufacturing and Services companies. Company size: Medium and large companies. Job Functions: Human resources, Sales, IT, and Finance. Entel Chile: one of the largest mobile companies in Chile. SGS Chile: one of the world leading inspection companies. Eurocorp Chile: one of the largest construction companies in Chile. VTR Chile: one of the largest telecommunication companies in Chile. Once again, we demonstrated that LinkedIn Sponsored Content Ads campaigns are a very effective, efficient, and satisfactory lead generation tool for B2B businesses. The first week campaign investment was USD $ 70. Cost per leas was USD $ 17.50 per qualified lead. To get on the first page of Google you have to write, publish, and distribute articles about your products, services, and customer needs, in a permanent manner. 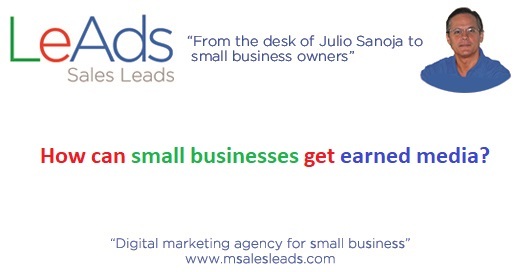 Our agency (MSalesLeads) is a 2.5 years old digital marketing agency for small businesses in Miami. Since the day we launched our agency online, on December 2015, we began a search engine optimization (SEO) project to get on the first page of Google, as a qualified lead generation strategy, and a qualified website traffic strategy. There are many other relevant search terms that get our agency on the first page of Google. We just mentioned here the most relevant and the better positioned. According to our Google Search Console, the last 28 days, our agency has had an average of 2,226 daily impressions on Google search results; an average of 190 impressions on the first page; and an average of 9 clicks per day. The first page of Google search results has been an effective, efficient, and satisfactory lead generation tool for our agency. We keep working on the agency SEO project to keep positioning the agency on the first page of Google for national and regional relevant search terms. So far, we have written, published and distributed 260 articles about our products, services, and customer needs. 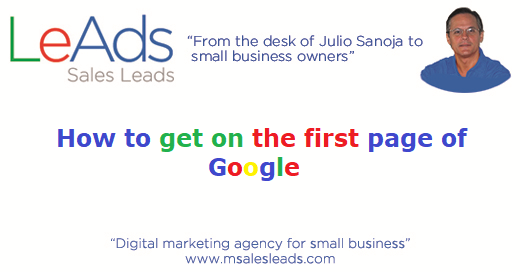 The first page of Google search results is the crown jewel of the digital marketing, since it is the most effective, efficient, and satisfactory lead generation tool for small businesses, whether b2b or b2c. It takes for a SEO project 2 to 3 years to position a small business on the first page of Google. It is a long time, but it is worth doing it. 1. International Sport Federation at Luxembourg. 2. Boutique Spa in Miami, USA. 3. Mattress manufacturing company in China. 4. 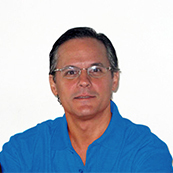 Consulting firm in Puerto Rico. 5. Sport training equipment manufacturing company in Florida, USA.